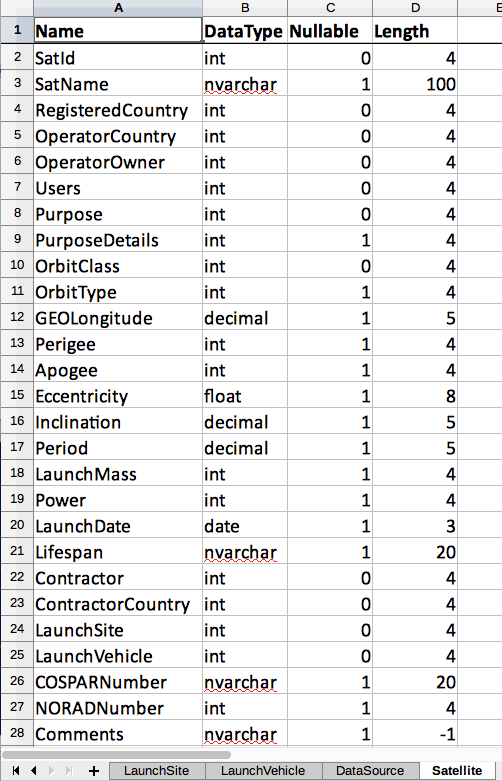 This week I had a user come to me asking about how fields were defined on a few tables he was using in writing some reports. Long story short, he’s been tasked with writing some new reports and updating existing ones, but he doesn’t have visibility to the database itself so he’s left with the “ok, let’s try this” approach and then reading error messages to debug when things go sideways. Very tedious. I asked him for a list of the tables he was most interested in, and while he worked on that I set to work on (of course) a quick & dirty PowerShell script to collect the data he needed – field names, types, and whether they’re nullable. With the help of dbatools and Doug Finke’s ImportExcel module, the resulting script to retrieve the requisite data and export it to an Excel workbook with one sheet per table is very short. Each table is on its own worksheet, with the header row bold and frozen so it stays in view while scrolling. But I can tell this isn’t disco enough for you, so I’m gonna put it right here. You can do this in a one-liner too. It’s not as pretty, but it’s quite doable and the resulting Excel file is identical. End to end, I turned this around in about 20 minutes and the the requestor’s life got easier in a big hurry. Best of all, when he comes back with another batch of tables for his next set of reports, I can turn the request around in less than five minutes. This tweet showed up in the dbatools Slack channel Friday afternoon. My first thought was “huh? John (t) hadn’t kicked code in previously? I thought he had.” Once I was over that, I reflected a bit on what John wrote here, and was reminded of how I felt when I started helping out with dbatools. It’s similar to Impostor Syndrome – I felt like I wasn’t doing much, small things here and there, in large part “just” documentation cleanup. The feeling that I was just throwing changes into the codebase just for the sake of making changes. It took me a couple of months and talking to several people before I understood that what I was doing was useful to someone other than myself and internalized what I was hearing. Here’s the thing that I have finally come to realize. Every contribution to an open source project is beneficial, no matter how small it may seem. I’d heard this over the years but didn’t really understand until very recently. John’s single line of code, no matter how it is that he got it into the dbatools codebase, made it better. His code will be executed by thousands of users of dbatools the world over. Most open source project maintainers/leaders are looking for help. Get out there on GitHub and look up a project you use. Find an issue that’s tagged good first issue or help wanted. Hop over to Up For Grabs and find a project that needs a little help. If your PR isn’t immediately accepted, work with the maintainers to get it into a condition where it can be merged . Single lines of code are welcome improvements to projects. Find yours. I registered for Summit about a month before getting actively involved in the dbatools project, so when I saw the team was running a pre-con and I was going to meet them, I was pretty excited. It was amazing getting to meet and hang out with Chrissy, Rob, CK, Shane, Jess, John, Shawn, Aaron, Ben, Kiril, Shane, and Drew (sorry if I forgot anyone! ), even if it was only for a moment. But I’ll have another post about the people of Summit. This one’s about dbatools being talked about all over Summit and my experience with that as a member of the team. I’m certain there’s a heavy amount of confirmation bias here, but dbatools seems to have caught fire in the SQL Server community. And with good reason! I was able to hand out about 300 of the dbatools fan ribbons I brought with me; half went to pre-con attendees, and the rest were handed out on the conference center floor at random. Sitting at the PowersShell table at the BoF lunches, people would join us and say “hey, I’ve heard about this dbatools thing but haven’t had a chance to learn it yet.” People would see mine and ask for one as they’d heard about the project and even used it themselves. The squeaky wheel gets the love, so make your voice heard on Microsoft Connect and Twitter! We even managed to get a group photo with the dbatools team members who were in the building! After all the “I can’t believe this is happening!” moments through the week, the final session on Friday was the icing on the cake. 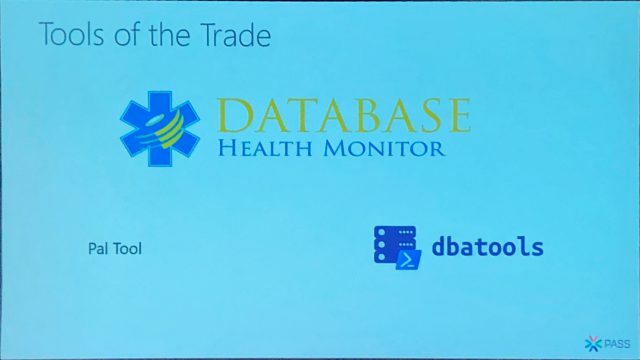 I was in Carlos L Chacon’s session Measuring Performance Through Baselines and dbatools popped up on one of his slides. Later, Carlos demonstrated a couple of functions, Get-DbaAgentAlert and Get-DbaUptime. The latter sounded familiar, so I jumped on Github and checked the history to confirm. Yep, it’s one of the functions I’d done some (non-CBH) work on. Which means that code I wrote was executed in a PASS Summit presentation! Yes, it’s a small thing and I’m the only person who even knew it as it was happening, but it happened. Which is pretty awesome.